Last night’s The Great British Bake Off had one baker celebrating his love of soccer video games with a series of meat pies. 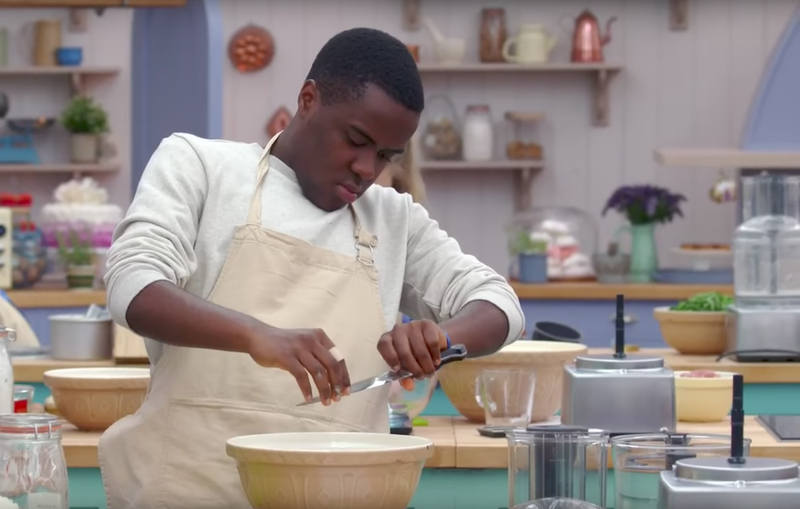 The Great British Bake Off is a delightful, stress-free baking competition show, and the eighth season is as pleasant as every other. Last night’s episode was all about pastry, and because this is the UK that meant savory pies. 19-year-old Liam Charles made a series of meat pies themed around his love of “football video games,” and they looked so delicious. “When I don’t bake,” said Charles, “I play a lot of football video games.” He decorated his pies with soccer-themed designs, like a scoreboard and jersey. One pie was made up to look like a controller. When Charles told judge Paul Hollywood that his favorite team is Manchester United, the judge joked that it was too bad that Charles would have to leave this week. Nevertheless, the pies, filled with sweet potato, feta and chorizo, charmed Hollywood and his fellow judge Prue Leith, who complimented his flaky crust, beautiful colors and well seasoned filling. Unfortunately, the recipe for these amazing-looking pies isn’t online, but you can find Liam’s other bake for the episode, a meat pie fill with goat curry and topped with a mango salsa inspired by his grandmother, on The Great British Bake Off website. I think I’ll try my hand at that one!